Fifty, not five, but I only have so many fingers. I turn fifty this year and feel pretty good about it. Forty was terrible. I was lost to myself and within myself, too frantic to be of use to anyone. 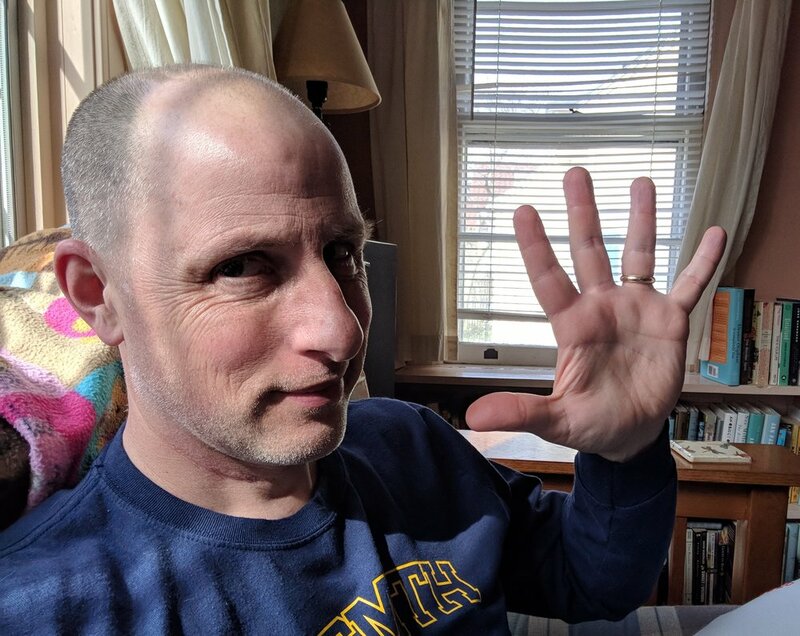 Approaching fifty, I'm calmer, maybe wiser, and not flailing about so much. I'm useful to those I love and to myself. I'm also ready for a challenge to mark the occasion. I have this idea to run fifty miles for my fiftieth birthday. Years ago, I hiked Mount Washington just to climb up something and come back down. That was a breeze, a delight every step. Even coming down in rain was so lovely I wanted to go right back up and down. Three years ago, shortly after Dad died, I entered a 50K to push myself to a new limit. That run was difficult. It hurt. On the fourth of six five-mile loops I didn't think I could finish. I barely got myself up for a fifth loop and if not for my friend, I wouldn't have gone out on the sixth and finished the run. I did finish and as soon as I did, there was no more pain. I felt good immediately and the feeling lingered. For my fiftieth, I'm going to run fifty miles on a five-mile loop starting and ending at my house where there will be a party, and I'll invite friends to share a loop with me. After the tenth loop, or earlier if things don't go well, I'll have a party waiting for me. Inviting friends to run a loop is a radical idea for me. I prefer running alone. Too much of my life involves having to interact with others. Running, I indulge in solitude, released from having to think about or solve anything. That I would invite friends is unusual, but this too is part of my challenge: to let people in. I don't want anyone to run the whole thing. Hell no. This is my run, a birthday present for myself, and I'll run it at my pace. I want ten friends to each do one loop, making each one a slightly different experience for me and sharing that with them. I have invited Stephanie, my wife, to share the last loop as I'll need her the most then. She doesn't run but is already talking about training so as to join me. I've told her that I'm not sure how much running there will be, but it's a dream to think of doing that last loop with her. Then when we finish, someone will give me a burger with mayo, bacon, crisp lettuce, and a perfect bun. I'll run through the finish line into a party. Sounds good. Training sounds good too. I haven't run much and this can get me back into running mind. It can be a writing project too, chronicling the preparations and whatever it is I might come to understand. The day I had this idea, I wanted to get started on training, but I couldn't afford time to run that day or the next. I was booked. Oh crap, I thought. I worried that this was just an idea, a pipe-dream that I would consider but never do. I'm never going to get started, I worried. Except I already had. I had drafted this piece of writing, imagined the idea, begun planning the loop, and thought of who to invite. I was already excited. I started doing push-ups again and loved them. I didn't eat much sugar that day or the next. I felt the possibilities of the project and was curious what might be next. And I couldn't wait to get running the third day. I did run that day and it felt great. I didn't plan too much about when to run next, how much, or any of that. Mostly I enjoyed the run, the feeling of moving again, and moving with purpose. I savored feeling good. Running fifty miles begins with one step, I'm told, but that's not true. It begins with deciding to run fifty miles and this excitement I feel. The running, it turns out, is an extra benefit in all this. I have a long way left to go and five months to prepare. I'll keep you posted on the progress.